The other night I needed something quick for dinner and I wanted to use up the last of my fresh herbs. 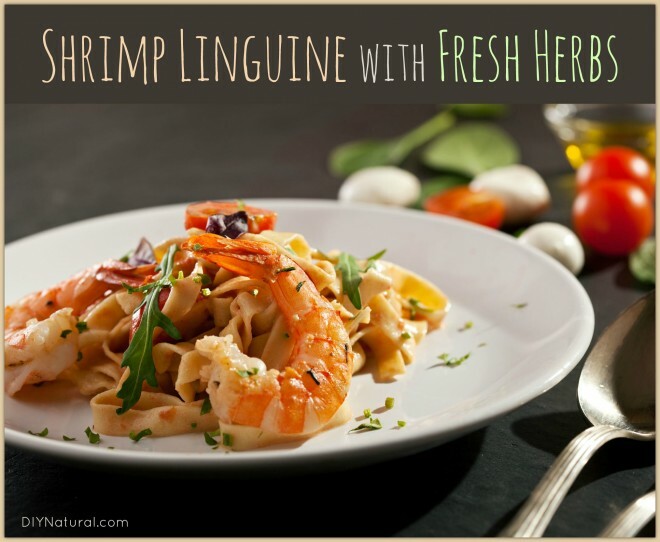 So I made up a Shrimp Linguine with fresh herbs that was delicious! If you need something fast for dinner, but turkey leftovers are out of the question right now, give this simple recipe a shot. Add salt to a pot of water and boil the pasta. I like the way tri-color linguini looks on my plate, but use whatever linguine you like. I use Celtic Gray Salt in my pasta water since it has so many minerals, but any salt will do. You don’t need much, but it definitely tastes better with the salt. Once the pasta is cooked al dente, shock it in cold water to stop the cooking process. Then add about a teaspoon of olive oil – it prevents noodles from sticking together and gives the herbs something to hold onto. Set noodles aside. For the shrimp, I use 1 pound of shelled and deveined shrimp in a 16-20 weight. This means there are 16-20 shrimp to a pound, which is a good size for dinner. I add about 1 teaspoon coconut oil to a pan and heat it well. Then I toss in the shrimp and saute for about 5 minutes. Add a sprinkle of salt – just a bit to enhance the flavor of the shrimp. Avoid cooking too long or shrimp will get rubbery. Just enough to turn it opaque. When it’s done, toss with the linguini. After the shrimp and the pasta are mixed together, add the herbs. You can chop them or leave whole. I like to put all the herbs I’m using into a coffee cup and snip at it with kitchen shears. This allows all the flavors to combine. Mix it all together with the pasta and shrimp. Then add the juice from a lemon and some fresh ground pepper and serve hot. You can adjust this shrimp pasta dish any way you like. Add garlic or onion to the pan before sautéing the shrimp. Broccoli makes a nice addition as well. You may even like some tri-colored peppers or some carrot shreds. This can also be made with chicken or as a vegetarian dish with no meat.